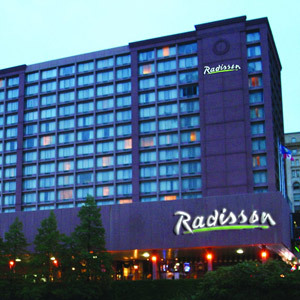 The Radisson Hotel chain features hotel bedding made by DOWNLITE. Some properties use our PrimaLoft down alternative bedding, while others use our hotel style chamber pillow and hotel style down comforters. Both the PrimaLoft pillows and chamber pillows are rated as medium density density. The comforters they use are considered lightweight on our website. All of the hotel pillows and comforters are made in the USA and are available for sale to home customers. Please note that style comforter they use runs skimpy in size - so for home consumers we actually suggest our Eddie Bauer World's Best Down Comforter. While this property should use the bedding described here in their rooms, it is not always possible to guarantee the ones listed below are the same as the ones you enjoyed while staying at this hotel (but we are sure you will love them).